It is a real delight to join you to confer the Chinese Government Award for Outstanding Self-financed Students Abroad. And it is exciting to attend the event for the eighth time in a row! Let me begin by extending my warmest congratulations to this year’s 27 outstanding awardees. My heartfelt appreciation goes to all the teachers! Thank you for your hard efforts and guidance for the students. This year’s event is special. We have with us not only outstanding PHD students who come from China’s mainland. We have with us a student from Hong Kong Special Administrative Region. And in the audience, we are joined by many more students from Hong Kong SAR, Macao SAR and Taiwan region. Let me extend a warm welcome to all of you! With these words, President Xi entrusted the young people with a historic mission and showed them the way forward. 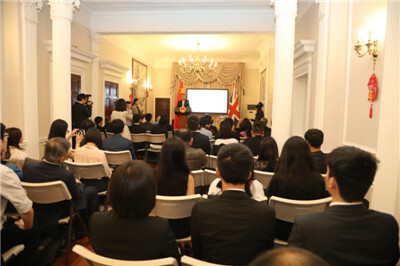 Today, at this gathering of the best representatives of Chinese students studying in the UK, and in light of my understanding of President Xi’s words, I want to express my three hopes for you. First, I hope you will be the backbone of your country. The baton of patriotism is in your hands. Generations of Chinese students in Britain have taken part in this relay over centuries. They have lived their lives like a glorious song of patriotism. Huang Kuan, a young man from Guangdong Province, was the first Chinese to have ever studied here. He began his PHD studies in medicine at the University of Edinburgh in 1849. And Huang Danian, who became China’s top geophysicist and an awardee of “Touching China 2017”. And always live your personal dreams in the process of striving for the dreams of your country. Second, I hope you will be the pillar of your country. An important mission is here for you to accomplish. A country’s strength depends on its talents. In today’s China, development is the top priority. To achieve development, people are the most important resources and innovation is the number one driving force. Therefore, China is implementing more proactive, more open and more effective policies to encourage the creation of the best minds. And that is exactly the purposes of the “Chinese Government Award for Outstanding Self-financed Students Abroad”. I hope you will study hard, broaden your horizon, build a solid knowledge structure and learn the cutting-edge technologies. This will prepare you for a future of significant accomplishments. I hope you will aim high. Be creative and innovative. I hope your expertise will enable you to serve your country in its economic and social development. 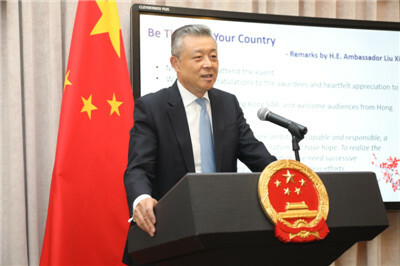 And I hope that as you ride the waves of transformation and innovation in China, you will put your talent to best use and live your lives to the fullest. Third, I hope you will be a bridge for your country to build closer friendship and understanding with the world. This year will mark the 40th anniversary of reform and opening up in China. It will also witness China-UK “Golden Era” shifting to a higher gear. Reform and opening up have been a great journey, in which both China and the world have achieved much progress. Going forward, China will stay committed to the path of peaceful development. China will continue to open up and pursue a mutually beneficial strategy. China will work with other countries to build a community with a shared future for mankind. You have an important role to play. With your experience of studying and living both in China and overseas, you have a natural strength in bridging different civilizations and cultures. I hope you will see it as your responsibility to promote friendly exchanges between China and other countries. I encourage you to tell the stories of China and the Chinese people to the world. Through you, the world can gain a better understanding of China. In you, the China-UK “Golden Era” will have a brighter future. Let me quote a Chinese poem to conclude my remarks. For a soaring bird, the sky has no limit. For those who are courageous, hardworking and determined to realize their dreams, the stage is set. I urge you to seize the day and seize the hour. I sincerely hope that as you live your personal dreams, you will be there for your country and work for the Chinese Dream of national rejuvenation. I hope you will make your life worthwhile in the building of a community with a shared future for mankind. And I hope your youthful vigour will drive you on as you live up to your historic missions. And I wish you great achievements worthy of our times.